Being overweight often goes hand in hand with high cholesterol, blood pressure, type 2 diabetes and other health issues. So, losing weight quickly should improve all those factors, right? What Can Be the Side Effects of Losing Weight Quickly on Your Heart? Most often, but not always, says a new study reported at the CMR (Cardiovascular Magnetic Resonance) conference at the beginning of 2018 in Barcelona, Spain. But this study also revealed the amazing benefits of a very controversial diet for all health issues. They recruited 21 obese people with an average body mass index of 37 kg/m2 and an average age of 52. They were given a low-calorie diet of 600-800 calories per day for eight weeks. The researchers did a magnetic resonance imaging (MRI) scan at the beginning and at the end of the study, as well as after one week of dieting. After one week, the MRI showed a 6% drop in total body fat, an 11% drop in visceral fat, and a 42% drop in liver fat, together with substantial improvements in cholesterol, blood pressure, and insulin resistance. So far, so good, but the problem? Heart fat content had also risen by 44% and was accompanied by a loss in heart function. By eight weeks, the body fat, visceral fat, and liver fat had dropped even further, and the other improvements had continued too. By that time, their heart fat content had also dropped to levels below their pre-diet levels, and their heart’s function had improved to better levels than before the diets. This is all good news, except for the loss in heart function after one week of dieting, which is quite alarming. The scientists speculated that it was caused by fat being released from other parts of their bodies into their blood streams, from where their heart muscles received it together with the blood. Their bodies obviously adjusted to the shock after a while and their heart muscles stopped accumulating the fat for energy, which immediately improved the situation. But because of this temporary effect from losing weight quickly, the scientists discouraged people with heart problems or cardiovascular risk factors from embarking on crash diets. 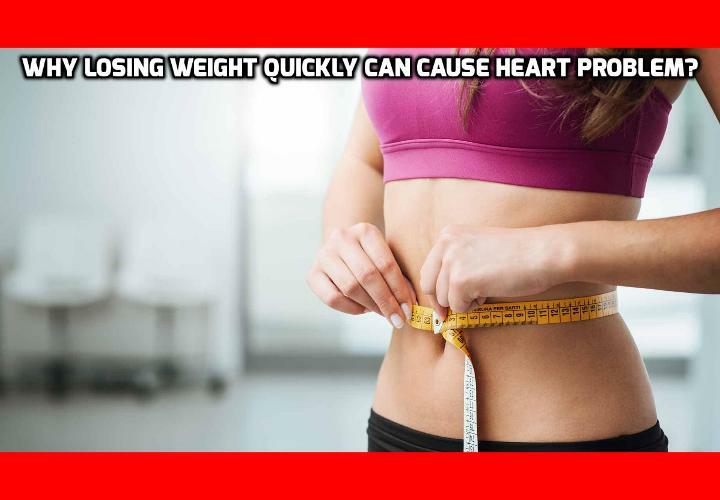 The big problem, of course, is that most of the people who are aiming for losing weight quickly have cardiovascular risks like high blood pressure, cholesterol, and so forth. One possible solution is to work your way slowly into a very low calorie diet by, for example, dropping your calorie intake slowly for two or three weeks before reaching 600-800 daily calories. What Happens If You Diet And Lose Weight Really Fast? Previous PostPrevious Why High Cholesterol is Responsible for This Deadly Cancer? Next PostNext Why this Special Salt Can Really Help You Lower High Cholesterol?